Arts, History, Math, English and IT, you don’t often find a project that can combine such a wide range from the school curriculum, but 34 pupils from Wimborne’s St John’s First School discovered that a 3D modelling workshop offered more than design and creativity! 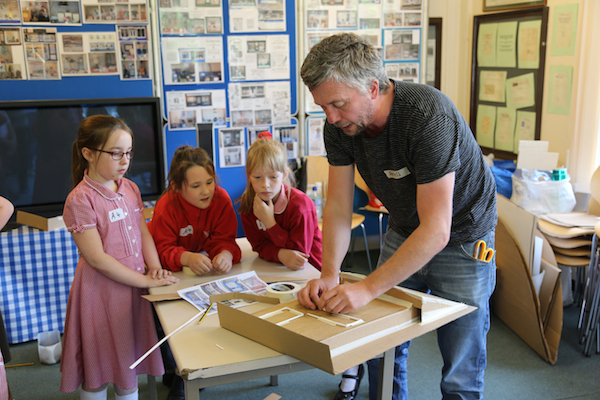 The 3D model-making project, with artist in residence Darrell Wakelam, took place at Wimborne Model Town. The Year 3 children worked in two groups and began by studying the Model Town’s historic replicas and selecting a building on which to base their 3D model. The first group then created the building façade using cardboard and papier maché. Putting their math into practice they worked out the angles for the roofs, gables and dormers. Whilst the ‘construction work’ was underway the remaining children explored the Model Town and discovered what Wimborne was like in the 1950s. Construction complete the groups swapped and the decoration of the models began. Artist Darrell Wakelam showed the children how to create tile and brick effects, how to blend paints and how to make windows look reflective. As well as calling upon the children’s creativity, the workshop illustrated the importance of teamwork, observation and attention to detail, with each of the six models illustrating different aspects of the buildings on which they were based. The 3D models were taken back to St Johns First School where the children discussed the processes they used so that the children can learn from each other. Using IT and English skills the children then created shop/business names to put on the models to complete them.